Jonah describes a Nineveh that repents of their sin, but Nahum describes an unrepentant Nineveh that is under God’s wrath. Nahum goes into great detail about the power and strength of God, especially in his role as an avenger. 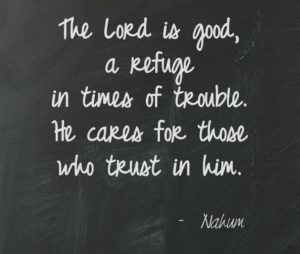 But before we get the impression that God is only about wrath, Nahum reminds us that God is good. In fact, God’s wrath toward Nineveh is not based on hate toward Assyria but rather love toward Israel. God stands up for his people because he is good. Sometimes we need a reminder of God’s goodness. With all of things that happen in our world and in our lives, we sometimes forget about this. We can think of God as Creator and Judge, but not necessarily God as good. God loves us no matter how difficult life seems. God loves us no matter how silent he seems. Take some time to reflect on God’s goodness and how he has revealed that to you over the years. Good morning friends! If you’re reading along in the scriptures with these daily devotionals, you may find Joel 2 to be a bleak prophesy, and initially a somewhat difficult passage to apply in our 21st century lives. What was most certainly a true devastation by locusts, combined with a severe drought that resulted in a widespread famine can – and does – have application today. When I was 31, my first marriage of almost 10 years ended abruptly. Without going needlessly into detail, I can tell you that the end of that marriage left me feeling as though my past several years had been spent in drought and famine. After more than a decade in a relationship and nearly a decade in marriage, I was left alone, childless, unloved and unhappy and very lonely. I could not fathom how or why I was in that situation. I remember wondering in the midst of it how I was ever to have the life I thought I was meant to – how would I have a long marriage with children when I was starting over in my thirties and no one was in my life? Time itself isn’t restored to us – but what is lost from the years can be. God can bless his people with bountiful crops to replace what was lost in drought or plague, and can multiply blessings on us – after going hungry not only are we able to have enough to eat but to eat in plenty and be satisfied. A little more than a year after my divorce I married my husband. He had two amazing and beautiful children already who instantly became my family, and God blessed us with our son Samuel and then Andrew right away. God most certainly restored to me the years the locust had eaten. In more abundance than I ever could have imagined or designed for myself. Have you experienced this in your life? 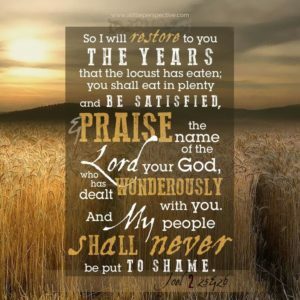 Are you in a time of desolation or famine, or are you experiencing the restoration God promised through Joel’s prophesy? Don’t forget to praise God for his mercy and blessings. Take time to recognize where, how and when God has restored you. 2 Samuel 11 tells the story of King David and Bathsheba (wife of Uriah), and David’s double sins of adultery and murder. The last sentence of the chapter is, ” But the thing that David had done displeased the Lord. ” After all of this happened, the prophet Nathan went to David and confronted him about the sin (in a subtle, indirect way) and when David realized the full weight of what he had done, he became overcome with guilt. David had to have known that what he did was wrong, but it seems like when everything was “hidden” or had gone unnoticed by people, he was able to live with himself. But after Nathan exposed to David the gravity of what all had transpired, David was overcome. Psalm 51 is David’s response to the weight of his own sin. David first confesses what he has done, then asks for mercy and forgiveness, then praises God’s attributes with worship, having received forgiveness. I think it’s unlikely that anyone reading this post is carrying around the guilt of a sin equal David’s sin of adultery/murder, but I’m fairly certain that at least one of you knows what the burden of guilt feels like. I know I do. Everyone has sinned, and one of the results of sin is guilt. We can be thankful for guilty feelings because they drive us to seek forgiveness. I invite you today to unburden your conscience in prayer. Tell God what sins are causing you to feel guilt, ask him to forgive you, and ask for him to fill your spirit with joy. While Moses was gone, the people get restless and think Moses isn’t coming back, and they start pestering Aaron (who’s left in charge) to give them a tangible god (idol) to worship. Aaron makes the people a golden calf. God sees this and becomes angry, and tells Moses he is going to destroy the people of Israel. Moses intercedes – he begs God’s mercy and forgiveness – for the people, and reminds God of the promises He’s made regarding the nation’s future. God agrees to spare the Israelites. Moses returns to the camp with the tablets written by the Lord and confronts Aaron and the people. After all of this, Moses asks who in the camp is on the Lord’s side and then instructs those that are to kill “his brother and his companion and his neighbor”. Moses speaks to the people about their sin and promises to go back up the mountain to beg God’s forgiveness for the people’s actions. Moses’ first response to God’s anger was to beg for mercy for the people. Then, after going down and seeing what had happened during his absence with his own eyes, he has an even better understanding of the gravity of the people’s sin. I’m imagining on a personal level there were likely feelings of hurt, betrayal, anger, frustration, sadness, embarrassment, etc. But Moses didn’t respond to the people in a way that indicated he was thinking about himself at all. He cared for the people. He knew they had messed up but wanted them to be back in God’s favor again. He prayed for them, begged for mercy, and even reminded God of past promises in hopes of salvation for the people. This isn’t a natural way to pray (at least for me, it isn’t). But as I reflect on these words, there are at least three very specific people in my life that I am convicted to go to God to fight for. Two are believers, one is not. But each has something (a golden calf, if you will) that is separating them from the Lord. Going to God and praying for his forgiveness and mercy on their behalf isn’t something I’ve thought to do – but just as Moses was willing to intercede for his people, shouldn’t we be willing to do the same? Today’s reading is Genesis 15. The first verse begins with, “After these things…” In the previous chapter, Abraham and just over 300 of his men defeated a much larger army made up of a partnership of four kings and all of their men. Following that victory, Abraham was offered a substantial reward by a king, but turned it away. God comes to Abraham, comforting him and promising him reward – and Abraham comes back with questions – what can you give me? I’m still childless! You haven’t given me any sons! God sends Abraham outside and has him look at the stars – Look at the stars, can you count them? If you can, that’s how many descendants you will have. v. 6 And he believed the Lord, and he counted it to him as righteousness. We know that this isn’t the end of Abram’s story. It was many, many years after this that Isaac was born. Abram had to be reminded of God’s promise and His covenant many times. But way earlier, as we just read – Abraham BELIEVED – and his faith was pleasing to God. It’s so easy to doubt God’s promises. If I can’t see the “how” and “when” that God will carry out his plan, my faith falters and disbelief seeps in and sows seeds of discontent. But thankfully God’s promise isn’t dependent on my ability to accept it. It doesn’t even depend on anything I do. The covenant God made with Abraham – made perfect through Jesus’ death and resurrection, is solid and true. It is done. There is nothing expected from me (or you). Every one of us is struggling with something today – or, more likely, may somethings. Finances, work stress, over-busy schedules, frustrating co-workers, illnesses, broken relationships, feelings of inadequacy, etc. I challenge you today to do one thing: BELIEVE. Believe that God knows these troubles (no matter how big small!) and that He can fix them. Don’t trouble yourself all of the logistics – just listen to his promise(s) and believe that they are true. I think we all know what it feels like when someone says “How are you? ?” and we answer “Great! How are you?” and they say “Not bad!” and then we just keep on talking, like we didn’t just tell each other a great big lie. Know what I’m talking about? God has worked miracles in my (and my family’s) life over the past year or so. Some of them are bigger and more obvious than others, but as I began reflecting on the things I’ve prayed for, asked others to pray for, worried about, lost sleep over, etc. for the past 18 months, it’s amazing how many ways God has answered prayers. What I want to share with you today is that many of these prayers didn’t even come from me. There was a time just over a year ago when I was facing so many difficulties at the very same time that it was literally weighing me down. There were some days that I was so overcome with fear and anxiety that I was unable even to think about moving forward. I’ve never actually been in quicksand, but I’ve seen it on movies, and if I had to describe the way I was feeling, it was that I was stuck in quicksand – unable to get out and sinking. I’ll never forget that conversation, although over the last several months we’ve had so many more that I can’t recount them all. We have shared many burdens with each other, prayed for each other, rejoiced with each other and mourned together as well. My prayer today is that none of you have burdens you are bearing alone. If you do, look for an opportunity to share them with a fellow believer. Conversely, look for ways to help carry another’s burden. The burden is much lighter when it’s not carried alone. Psalm 68:19-20 – Praise be to the Lord, to God our Saviour, who daily bears our burdens. Our God is a God who saves; from the Sovereign Lord comes escape from death. 1 Peter 5:6-7 – Humble yourselves, therefore, under God’s mighty hand, that he may lift you up in due time. Cast all your anxiety on him because he cares for you. Isaiah 46:4 – Even to your old age and grey hairs I am he, I am he who will sustain you. I have made you and I will carry you; I will sustain you and I will rescue you. 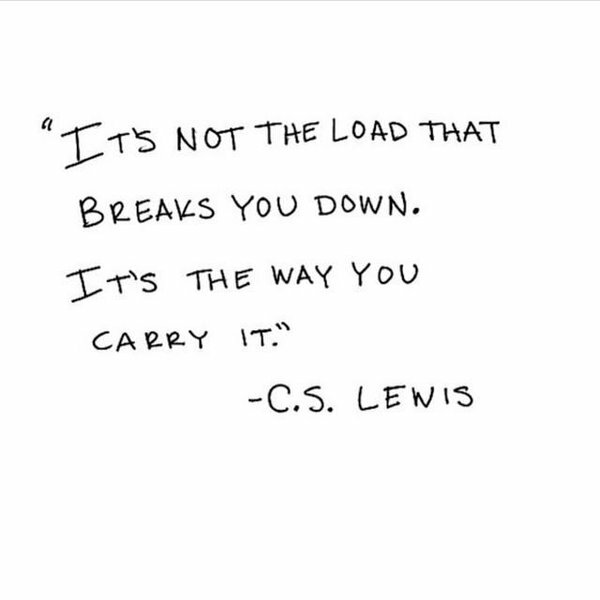 Posted on December 11, 2018 December 10, 2018 Author Rachael PerryCategories UncategorizedLeave a comment on How do you carry your load? Today’s reading is John chapter 18. Have you ever seen the movie The Passion of the Christ? I only watched it once – in the theater the weekend it was released (over 14 years ago). Reading John 18, I couldn’t help but visualize the betrayal of Jesus by Judas and then by Peter by the imagery portrayed in that movie so long ago. I find myself thinking – HOW? How could these men who knew Jesus betray him this way?? Not just Judas – but also Peter, denying that he was a disciple, not once – but three times. I tell myself that surely I would never deny my Lord and Savior like that. But how often do I take an opportunity to proclaim the love of Jesus to people? Not as often as I’d like to think, if I’m being honest with myself. In fact, I don’t even put one of those cool magnetic “e” things on the back of my car because I don’t really want to have people watching my driving and knowing where I go to church. Is that a betrayal of Him? Probably not an intentional, outright denial – but I think it can be an easy slide. Here I am, living on earth a very temporal life, KNOWING that everything I have and love is only mine for a very short time, and that eternal life is guaranteed and freely given. Not just for me, but for anyone and everyone that accepts Jesus as their personal savior. As you go about your busy Tuesday, reflect on these things. Think about whether your actions bear witness to the truth or whether they are a betrayal. 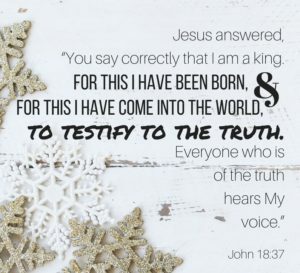 Lord, thank you for coming into this world to bear witness to the truth. Thank you for the unbelievable gift of your life and blood for our sins to be wiped clean. Let your truth light the darkness in our daily lives, and let us proclaim your love and faithfulness at every opportunity, without hesitation and without shame. This past weekend was rough for me. I’ve been sick for two weeks, and was looking forward to rest. In the middle the day on Friday I received a message that I would be entertaining houseguests and that they would be at my house before I even got home from work that day. Then, three of four kids got sick over Saturday night with fevers and stomach virus symptoms. Not only was I tired and sick myself, I was now up through the night nursing sick babies and cleaning up the symptoms from beds, carpet, etc. Having to prepare food and be hospitable in the middle of everything (especially when this was an unplanned visit) was not an easy task for me. On top of all of that, it has been decided that I am to host a Thanksgiving meal next week as well. Instead of looking forward to the holiday, I’m dreading it. I’ll be working long hours straight up until the night before the holiday. Finances are tight, and trying to squeeze extra groceries out of the budget to host people here is making me feel very stressed. And, as commercials and marketing media are constantly reminding me, Christmas is right around the corner. Yet another holiday for me to spend working, cooking, cleaning, and trying to find a way to squeeze gifts for everyone out of a budget that is stretched to the max. I am well aware how whiny and self-indulgent these thoughts are. But they’re real and they’re my current struggles. So, reading John 6, here’s how the Holy Spirit spoke to me in my self-pity mode. This crowd of 5,000 people has gathered to listen to Jesus. We don’t really know where they all came from, or why they all ended up there being unprepared to feed themselves, but for whatever reason that was the situation. The disciples – who have been watching Jesus heal the sick and perform countless other miracles – start getting all worked up about how they were going to feed this crowd. Jesus just has them get all the people sat down and commands that the five loaves and two fish be broken and distributed. Can you even imagine this scene? 5k+ people and 5 loaves of bread with 3 fishes. But after the food was passed around, there were leftovers. Do not work for the food that perishes, but for the food that endures to eternal life, which the Son of Man will give to you. For on him God the Father has set his seal.” 28 Then they said to him, “What must we do, to be doing the works of God?” 29 Jesus answered them, “This is the work of God, that you believe in him whom he has sent.” 30 So they said to him, “Then what sign do you do, that we may see and believe you? What work do you perform? 31 Our fathers ate the manna in the wilderness; as it is written, ‘He gave them bread from heaven to eat.’” 32 Jesus then said to them, “Truly, truly, I say to you, it was not Moses who gave you the bread from heaven, but my Father gives you the true bread from heaven. 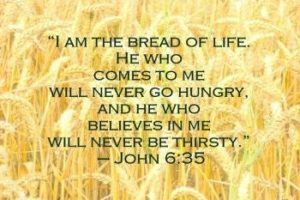 33 For the bread of God is he who comes down from heaven and gives life to the world.” 34 They said to him, “Sir, give us this bread always.” 35 Jesus said to them, “I am the bread of life; whoever comes to me shall not hunger, and whoever believes in me shall never thirst. Why is it that I continue to doubt God’s faithfulness? Why do I wonder how we will eat, or how we will make it through another rough time? Hasn’t he shown me over and over again that he provides for us? Haven’t I seen miracles in my own life and in my family’s lives over and over again? Lord, thank you for providing our daily needs. Thank you for your abundant grace. Forgive my doubt and worry. Turn my focus to the food that endures and never perishes. Let me desire the bread of life more than I desire material things. Thank you for your words in scripture and for brothers and sisters in Christ constantly encouraging and praying with me.